Golly February already and we're still feeling that wintry cold weather. Still nothing like being cwtched up at home with a piece of embroidery in your hand watching Dancing on Ice. The Girls have been very busy this week obviously doing just that!!! 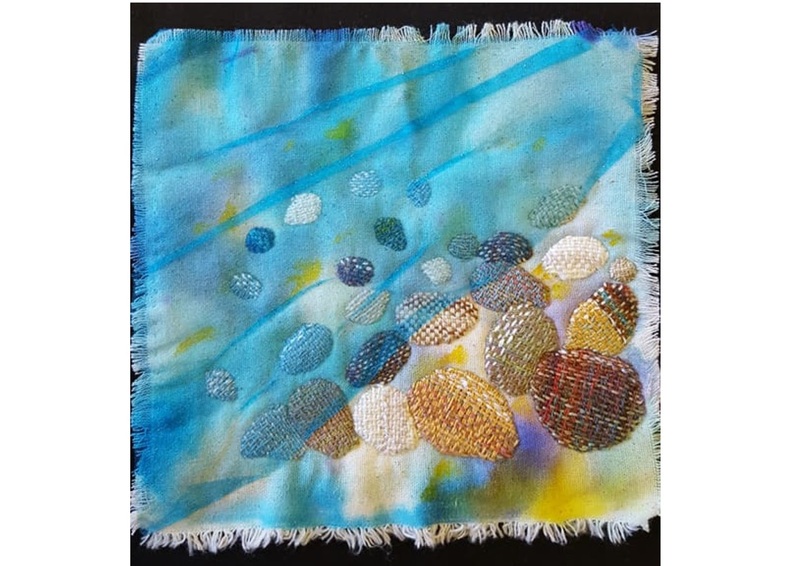 Ann's lovely woven piece has taken on a new lease of life, she has added shells, pebbles, applique fish and a gorgeous little seagull flying above the sea. Ann always surprises me at how much work she can produce in a week, here is another piece of work she has been beavering away on. There is so much hand embroidery on this piece, she has covered every inch in sumptuous stitching. Lazy Daisy, pistol stitch, french knots, finger rings, Brazillian embroidery and beading to mention a few. Superb !!! If you remember from last week Ann was dedicating this piece to her Grandma who taught her how to sew, I think she will have made her Grandma very proud indeed with this wonderful picture machine stitched with a little bit of computer embroidery too with the Singer brand name, something that I'm sure Ann's Grandma would have loved. 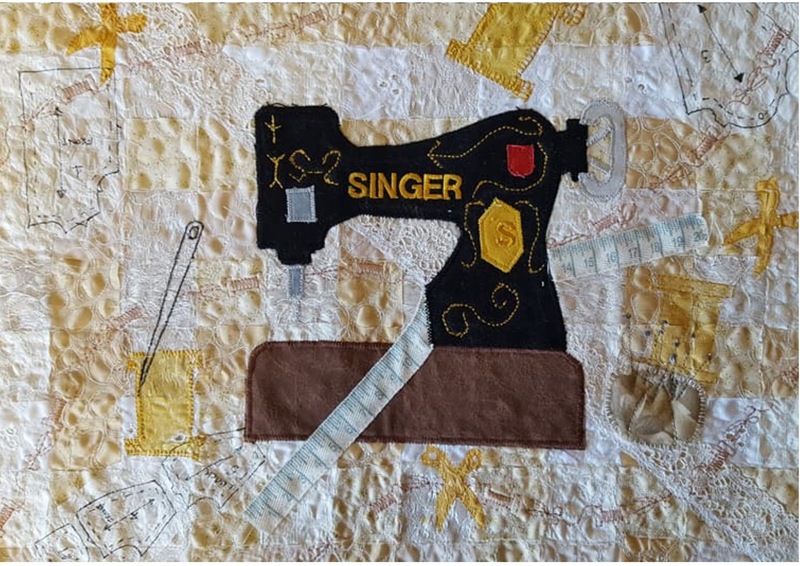 Celia's piece has advanced from last week with lots of hand embroidery, embellishing these gorgeous fabrics which she has rust dyed herself. I love to see the progression every week of each piece of work, everyone encourages each other, take ideas from each other, offers of advice and sharing of skills. I love the colours in Celia'a work, the orangey, yellow with the black seems to go so well. Sonia has taken her woven piece and take inspiration from the fabric to complete her embroidery which she is going to make into a book cover. 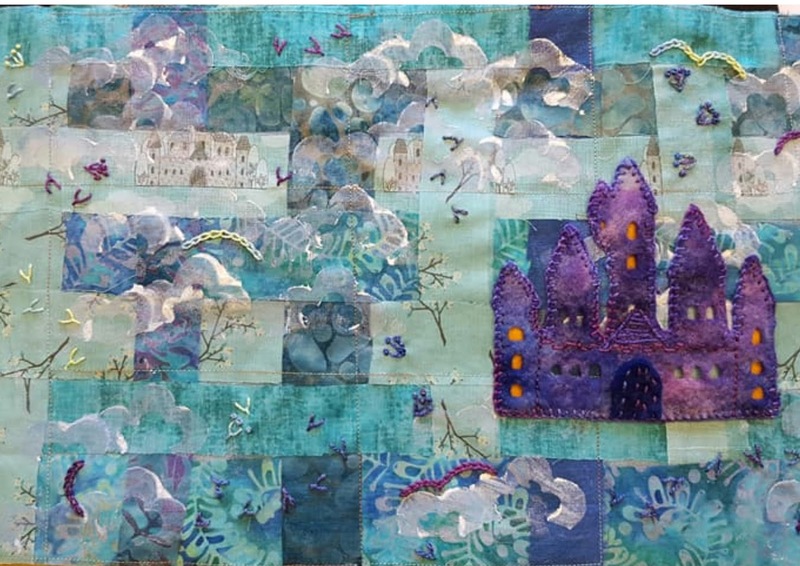 If you remember from last week she had printed on some clouds and over last week she has hand stitched them to highlight the clouds and has made a castle from felt embellished with hand stitches which will be a focal point for the front of her book cover. Sonia has also completed a piece on needle weaving, she started this a couple of weeks ago if you remember, and she has added more pebbles in graduating size and has coloured the background so that the pebbles feel like they are under water. The needle weaving is beautifully stitched and the colour combination is wonderful. This week we studied the options of stenciling a design rather than printing, it caused a little confusion because designing a stencil is much more difficult than it looks. In printing a design any design that protrudes from the holding block will print but with a stencil what is cut away forms the design. This has to be thought out quite carefully when you want a more intricate pattern. 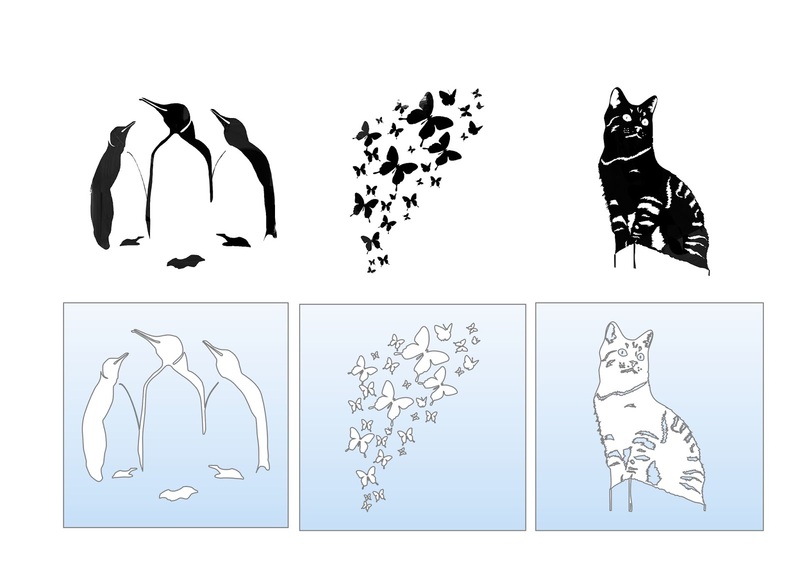 The whole design cannot be cut away other wise you are left with a solid outline of a design, so the design has to be drawn as separate shapes that still connect to reveal the desired pattern as in the samples below. Who's a pretty boy then ? 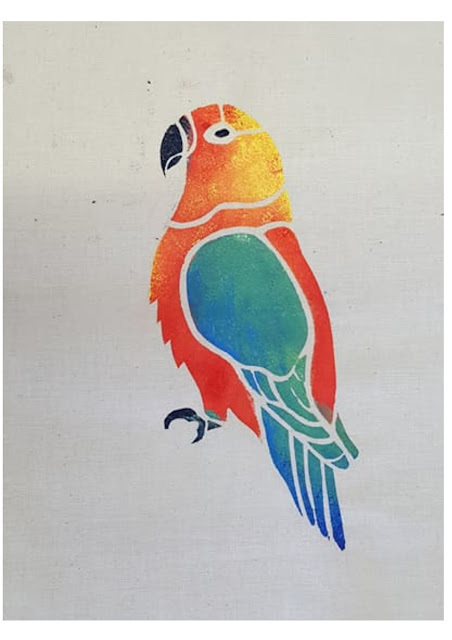 You can use many things to make a stencil, Mylar is a plastic sheet that most stencils are made of, it is very durable, water resistant and will last many years if you look after it. But to buy it is very expensive. We can substitute Mylar with card board or strong paper covered in PVA glue, Manilla card which is coated with a waxey substance, laminate sheets, clear plastic from gift boxes or in our case we used Freezer paper it's not very strong but you can iron it onto fabric and therefore it doesn't move around and helps to stop the paint from seeping under the stencil giving smudged edges. With care you can reuse the stencil several times. We also use acrylic paint for our trial pieces but fabric paint can also be used if the piece you are working on needs to washed. Why don't you have a play and see what you can come up with, it's not that difficult and who knows we may start another stenciling revolution like the early 90's when every wall and piece of furniture was stenciled within an inch of it's life. I like it, it's great fun and you can achieve some great designs for stitch! Don't forget make some time to create! and speak to you again next week.